Why should MPs be exempt from new law to block tax avoidance? Dr Burgess, a member of the Royal Economic Society with a special interest in taxation, was Director of the Economic Study Association till his death. In his Budget, the Chancellor of the Exchequer promised to create a more level playing field by tackling tax avoidance, something the rich are much better at than the poor. To implement this, his Finance Bill contains complex and at times draconian legislation which could impact on any employee or employer in the UK, but, as Ian Cowie in the Daily Telegraph points out, in an obscure clause of the bill MPs are specifically exempted from these new restrictions. Why, he asks, should that be? Surely, What is good for the goose is good for the gander? If the Chancellor is so anxious to cut tax avoidance, why does he not abolish taxes and collect the rent? Rent as a tax base has the great advantage that it cannot be avoided – you can’t hide it or take it off-shore and it is irrelevant whether the owner of the property is a British citizen or a non-dom. Whoever owns the site pays the market determined ground rent. Such a fundamental change in the way government is funded would need to be introduced gradually, but it would give the Treasury a much more secure and predictable source of revenue and stimulate economic activity, something the Chancellor is also trying to do. 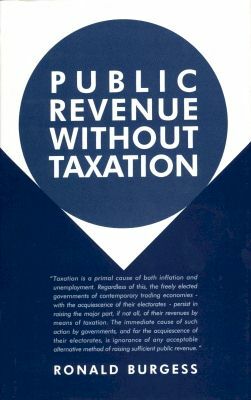 In Public Revenue without Taxation, Dr Burgess suggests how such a transition could be implemented with a minimum of disruption, so that politicians with an eye to the next election might reap some results within the lifetime of a parliament.